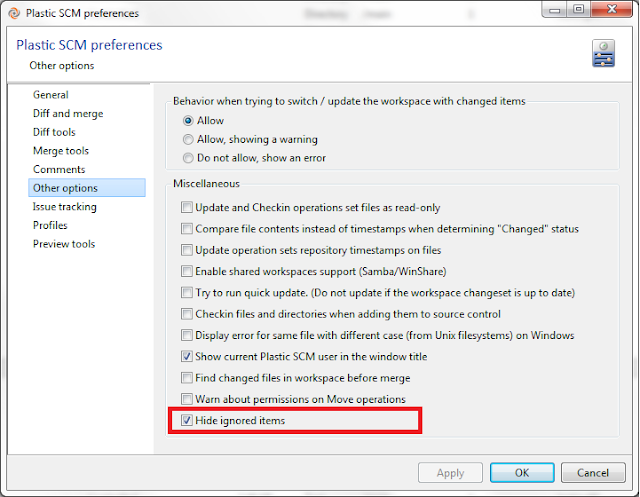 Plastic SCM blog: Plastic SCM 4.1.10.447 External Release is out!! Plastic SCM 4.1.10.447 External Release is out!! Plastic SCM 4.1.10.447 (Bilbao) is out there! Check the full list of changes here and visit the Plastic SCM download page to install or upgrade your Plastic SCM setup. As usual, you can suggest and vote new features on the Plastic SCM Forum page and tell us your opinion about Plastic SCM or use the User's Voice channel, as well. Hide ignored items in the Items view (requested from the User Voice): We've added a new option to hide ignored changes. This option is not checked by default, so you'll see the ignored items in the Items view and if you want to hide them go to Preferences -> Other options and check the "Hide ignored items in the Items view" option. Take into account that this option does not work in the Pending Changes view, which has its own preference to show / hide Ignored items. GUI (requested by customer): An error was being thrown when the user removed a workspace and then performed a switch to a branch (or changeset, or label) operation on a different workspace. Fixed. GUI: When we had a workspace pointing to a unreachable server, the Items view got a bit stucked. This is now fixed: a proper message is shown so that the user can update to the right server and thus the issue is solved. Update merge (forum request): When working in a certain changeset that is not the HEAD of the branch and a checkin was carried out (an update merge takes place, since there are newer changes on the server) the selector was not updated to the resulting changeset. Now this issue is fixed. Pending changes view: The differences shown for a replaced item that was moved too showed only the content instead of the differences with the previous loaded revision. Fixed. Visual Studio Package: The second time the user clicked on the "Show pending changes view" context menu option of the Branch Explorer, no action was executed. This context menu option is only available when right-clicking on a checkout changeset. Fixed. Web UI: The calculation of the repositories activity graph that appears in the home page (the one that lists repositories) has been fixed. The information was correct but there was a wrong condition that lead to long periods without updating the data shown. That's all for now. Enjoy!